For those of us who spent out youths growing up way back in the 1990’s, amongst the dinosaurs and burgeoning mountain ranges, we know that a good pair of shoes helps you go fast. From Sonic the Hedgehog to Michael Johnson’s gold spikes at the Atlanta Olympics, the right shoes made all the difference. Looking at the modern-day world of motorcycling, this is something that Alpinestars knows well. New for 2014 are the Alpinestars S-MX 3 Boots. It comes to the game as a replacement of the S-MX 2 and includes a few key changes throughout. With a slightly less rigid sole when compared to the S-MX 2, the newest iteration has moved more towards that of the S-MX 6. New features include ratcheted buckle closures, slightly higher coverage, an etched shift protector, and a more cushy/padded feel for increased comfort off of the bike. At the same time, the external TPU protection on the outer ankle, shift pad, heel counter, and medial strap with lateral ankle buckle holder all work together to achieve a CE safety certification throughout. Whether you are up against Doctor Robotnik, Frank Fredericks, or the weekend twisties, you have to have the right shoes for the job. 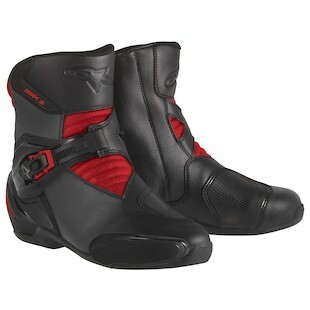 Sonic had his booties, Michael Johnson had his golden spikes, and you can rock the new S-MX 3 Boots from Alpinestars!